F&F White Floral Print, sequin front, jersey back Top. Size 18 • Viscose/elastase. Sequinned at front, Soft, stretchy material at Back. • Scoop neck. • V back with tie. • Hip length. Very good used condition. UK bidders and paypal only. Smoke and pet free home. Buy 3 items and get postage for just £3.25 total. 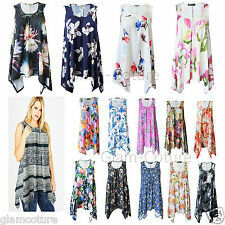 New listingWhite Stuff Boho Flower Print Tunic Top, Size 18 - Lovely! Preloved casual tunic top in good condition. Small zip at centre back near neckline to fasten. Purple multi print floral print dress in a size 26/28. Cross over v neckline. 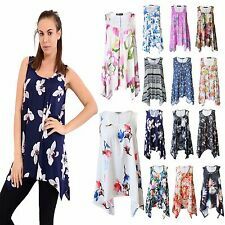 Ladies Summer Top Size 18.multi Col. Condition is Good.fully lined. A really lovely top from this desirable British label - pre loved and in great condition. It's made from a soft, draped viscose and features a ditzy floral print in teal green and cerise against an off white base. Otherwise, it is in good condition & still lovely to wear. Armpit – armpit – 28". In used but good condition with minor signs of wear to the fabric which are barely noticeable when worn A little faded from washing and wear which is normal for viscose material. CAP SLEEVE FLORAL TOP; SIZE 26 - M&S - PLUS SIZE. THE TOP HAS A SCOOPED ROUND NECKLINE AND CAP SLEEVES. THE BACKGROUND TO THE TOP IS GREY WITH A FLORAL PRINT ALL OVER. The top is free size, would suit anything between 18 20 22. Loose fitting. Longest length 38". The colour is a pale beige or dark cream. Batwing sleeves. Gorgeous draping floral blouse from Anthology. Ivory viscose jersey fabric with a stunning retro-style bright floral print. Length (shoulder to hem, front): 32.5” /82.5cm. Length (shoulder to hem, back): 34” / 86.5cm. A very pretty semi sheer floral top from Per Una size 18. Buttons at the front with tie neck. Plus Size 20 Monsoon Mustard Yellow Floral Short Sleeved Blouse. Condition is Used. Dispatched with Royal Mail 1st Class. This is a lovely blouse, looks great under a suit for the office, brightens up an outfit. Mainly mustard which is bang on trend this year, with teal and cream also. 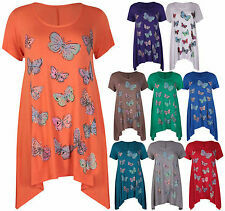 Very soft and comfortable to wear, lovely for the warmer weather. Also great with white trousers or shorts. Nice for evenings out on holiday when you want your shoulders covered. Still in good condition, no obvious signs of wear. Only selling due to weight loss. From a smoke and pet free home. pit to pit 26 inches. 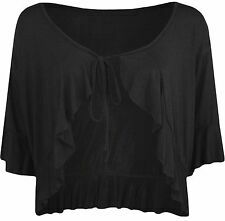 This top has ties at the back of neck and has cutaway armholes. 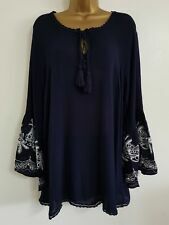 Size 18 blue stretchy top with zip at back neck. Blue/Pink Floral Print. armpit to armpit: 23". length from top of shoulder to hemline: 24". been worn but still in good condition. White Stuff Pink / Burgundy Pineapple Print Top with frill at hem Size 18. Actual measurement bust 42” length 25” Condition is Used. Dispatched with Royal Mail 1st Class. Small frill around the neckline and three button front placket. Condition is Used. L ov el y fo r th is t im e of y ea r fr es h lo ok in g an d thea dd ed b ea d de ta il m ak es i t re al ly pretty. I am as 100% honest as I can be. SIZE 26 28. HUGE EXTENDED FAMILY CLEAR OUT. 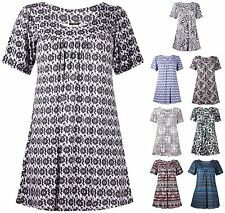 New listingWhite Stuff Boho Tunic Top, Size 18 - Lovely! Size 18 Tunic Top By Joe Browns 3/4 Sleeves. Condition is Used. Very slight bobbing on the bust but its the material type. Hence buy it now price. Dispatched with Royal Mail 2nd Class.